In the countries of Europe’s periphery, emulating the popular uprisings in the Arab world, drawing warmth from Tunis’s Qasbah and Cairo’s Tahrir Square, people took back and took over the public space. The Arab Spring gave us confidence in “ourselves” and our collective ability to change the existing order. And looking also at Iceland and Greece, the 15M movement broke with the prevailing skepticism, resignation and climate of apathy. But a year after popping up, what remains of it? What has been achieved? What challenges and prospects lie ahead? The movement of collective outrage heated up fast. Beyond the thousands who occupied the squares, attended meetings, marched in the streets… many others, from their homes, identified with this angry tide that “represented” them. And with 23% unemployment, 175 evictions per day and one in five households living below the poverty line in the Spanish State, how could anyone resist growing indignant, rebelling and disobeying? The M15 has been able to go beyond the activist core of protesters, awakening a new militant generation and lifting many people out of their easy chairs. 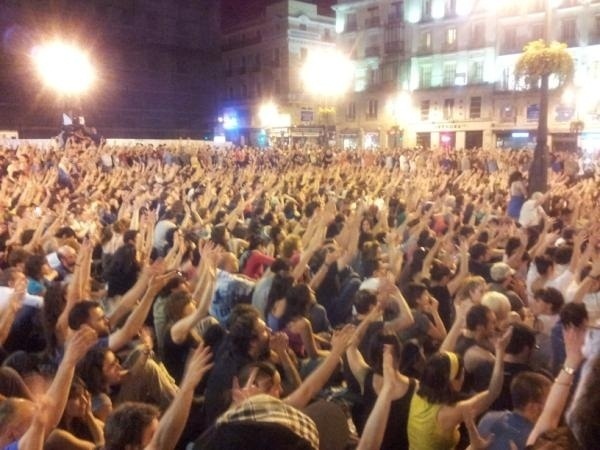 These are young people, environmentalists, women, seniors …, who made up the “people of the Plaza del Sol” in Madrid and “Plaza de Catalunya” in Barcelona. A year after M15 we see how the movement has charged both those holding economic power and those holding political power with social responsibility for the current crisis, highlighting the close links and collusion between them. M15 has unmasked a low-intensity democracy, held hostage by financial power; those who govern serve the 1% not the 99%. It has succeeded in altering the collective imaginary and the political atmosphere to its roots. 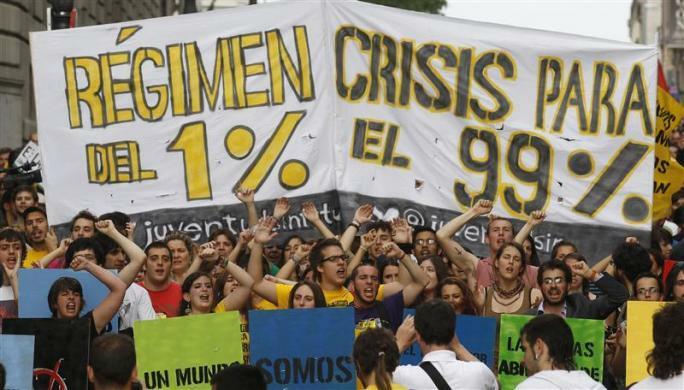 The crisis has provoked a social, political and economic earthquake, but the emergence of 15M has also, conversely, generated a process of re-politicization of society. The deepening crisis and the emergence of the movement has allowed people to “think big” and “act big.” Today, there are not only calls demanding reform of the banking system but promoting the expropriation and nationalization of banks and for “nonpayment” of unjust, illegitimate and illegal debts. The action agenda has expanded and radicalized; it is no longer enough to simply demonstrate and take to the streets, now we occupy plazas, block traffic, stop evictions… The crisis exposes how often what is “illegal” is legitimate and what is illegitimate is precisely what is “legal.” To occupy houses or banks can be punished, while evicting families or swindling with “preferentes” (complex bonds of ownership) by the banks is perfectly legal. Facing a reality so unfair, why not disobey the law or support those who do? This is one of the great victories of 15M: to make these forms of struggle normal and socially acceptable. And what challenges and prospects do we face? Changing the world from bottom up is neither easy nor quick, and for this, as the philosopher Daniel Bensaid pointed out, you must arm themselves with “a slow impatience”. We must rebuild another correlation of forces between those in power and the vast majority of society, and this requires a long march, which does not always follow a predictable or straight path. And M15 is just the prologue of this cycle of struggles that has begun. At the same time, to win concrete victories beyond some defensive ones is extremely difficult. Despite the anger and social unrest, the cutback policies are intensifying. To combat slander, criminalization and repression is another key task in the coming period. The erosion of the rule of law is accompanied by the emergence of the state of emergency. This we have already seen. The more the welfare state withers, the more the police state grows. It begins by slandering those who are mobilized by dubbing them “perroflautas” (street musicians), then goes on to criminalize them by calling them “anti-system thugs,” and steps up repression using preventive detention, websites that insult, etc. What’s involved is creating “an enemy,” to justify repressing it. The politics of fear and intimidation is the other face of the policy of cutbacks. But the best antidote to such measures is the massive size of the protest. How can you slander the seniors of a town who defend a clinic from being closed down? How can you smash down those who defend themselves with their books in their hands? It can be done, and has been done, but not without paying a high price in public opinion. So far, repression has boomeranged, striking back against the power. It has often been said that with M15 “fear has disappeared”, but “fear” continues to be very present in the workplace, where capital dominates with hardly any bumps. That the leadership of the major trade unions submitted to the government and the employers, weighs heavily on all social movements. We need a militant trade unionism, which has its center of gravity not in negotiations from above but the struggle from below and that defends a culture of mobilization and solidarity. And if the movement plans a radical shift in the paradigm, we cannot forget other key aspects of the crisis, beyond the economic ones and the fight against cutbacks, debt and privatization. The ecological and climatic aspect of the crisis is a central element. It is impossible to believe in “another world” without fighting the logic of a system of that prioritizes production but ignores the limits of the earth. Economic and ecological crises are intimately intertwined. Nor is an alternative possible unless it also seeks to end a patriarchal system that refuses to recognize women’s work, making it invisible. We can say the current economic crisis clearly has a feminine face. International coordination is another major challenge we must resolve. Although the movement has had successful days of global mobilization, like that of last October 15th, 2011, and now the M12 and M15, its international coordination is still weak. Capitalism is global and, consequently, resistance to it must be equally global, internationalist and built on solidarity. From the public squares to global outrage there is a road of comings and goings we will have to travel more each time. Looking backwards a year, few would have foreseen the magnitude of the cuts in the Spanish State (which reached making Constitutional Amendments to put a ceiling on public deficits) or repression (threatening changes to the Penal Code to severely punish non-violent direct action), but neither would anyone have imagined this angry tidal wave that has smashed on the political and social panorama. In troubled times, certainties tend to be false and we have but one that isn’t: those in power will not give up their privileges without a fight. We do not know the outcome of this “battle” between “those at the top” and “those on the bottom,” but if we do not struggle, the game is already lost. Esther Vivas has published recently, with Josep Maria Antentas, “Planeta indignado. Ocupando el futuro” (Ed. Sequitur). This aricle has published originally at Público.es. Translated by John Catalinotto.